First, let me address the white elephant in the room. Where have I been? Or better yet, where have the blog posts gone? Well, having three kids in 3.5 years has really taken away from extracurricular activities. Have I stopped cooking? No. Is nutrition or healthy eating less important? No. Actually, my husband and I are more healthy now after I had him read The Blue Zones by Dan Buettner (more on that in a future blog). Most importantly I’ve thought of my blog constantly when I am making recipes worth sharing. That’s why I’m back. I have a list of recipes I’m dying to share but after shopping for them, cooking them, cleaning it up and putting the kids to bed I find myself exhausted and in bed. That’s about to change. My growler of cold press coffee and school start for the girls have me ready to post! First, before corn season is over I want to share a delicious end of summer recipe that you HAVE TO TRY. It would pair perfect with grilled food, fish or even as a side to a Mexican food night. My mom found this delicious recipe in the Milwaukee Journal Sentinel this month (adapted from food52.com). It has citrus, crunch, cheese and spice and doesn’t take long to make. YUM YUM YUM! Heat olive oil in a large saute pan over medium high heat and saute corn kernels until slightly browned (6-8 minutes). Add peppers and cook 2-3 minutes until barely softened. Add Sriracha and stir to coat (the recipe says to do this in the pan with the peppers and corn but we did it at the end so we could take some out for the kids before we made it spicy. Either way works). I’m always trying to find creative dairy free recipes so our oldest daughter can enjoy some of our favorite dishes (she is very intolerant to dairy and I’m hoping she out grows it). Recently I made an awesome one that I will definitely make again (I can’t say that for many) and had to share. I first saw it when my friend Ashley posted it on Facebook from Bold Vegan’s blog. The title was “extra Creamy Vegan Mac and Cheese (not some hippy dippy “cheesy”Mac and cheese).” This catchy title caught my attention as a I love cheese and am not a vegan. Plus, I’ve been wanting to try using nutritional yeast as people say its a great cheese alternative. Nutritional yeast is a deactivated yeast sold in flakes or powder form for cooking. It’s a great source of B vitamins, folic acid, selenium , zinc and is a complete protein. If you are a vegan or vegetarian I recommend looking for one that is fortified with vitamin B12. Two tablespoons of nutritional yeast contain about 45 calorie and 8 grams of protein. The recipe below uses 1/2 cup which would be ~24 grams of protein from the yeast. It produces a cheesy, nutty flavor that was great in our recipe. You can use a few tablespoons to add creaminess to sauces, soups or mashed potatoes (I plan to start doing this) or you can add in more for a cheesy texture. I’ve also heard you can sprinkle it on popcorn for added flavor. I found mine at whole foods in the bulk section and would imagine most co-ops also sell it. For a little over 1/2 a cup it cost me $2.09 ($18.99/lb). Without further explanation I will let you get to the recipe. Know that my husband, brother, mom and I all liked it. It was creamy with a nice slight nutty flavor and an added bonus that there were vegetables blended in! We served ours with sesame green beans. I’ll include how I make those below as they are a family staple. Place potato, carrot and onion in a pan, cover with 2 cups of water and simmer for 20 minutes with the lid on. While the potato mixture is cooking start your water for the noodles and cook noodles according to the package. Pour mixture into a blender and blend for ~1 minute until creamy and smooth (NOTE: I used an immersion blender and did the blending in the pan it cooked in which was super easy). You may need to scrape the sides down from the blender a couple of times for everything to get incorporated. Add coconut milk to the blender and continue to blend until mixture is creamy throughout. Pour cheese sauce over cooked noodles. If you are crunched for time like me you can buy a bag of green beans to steam in the microwave or if you have more time or fresh green beans sautee them in a pan with a small amount of olive oil. I like my green beans with a lot of crunch so I usually do the least amount of time recommended on the steam bag. Once they are cooked drizzle with sesame seed oil, salt, pepper and sesame seeds and serve. It’s time I pay respect to one of my favorite grains. You may be asking why we need to pay respect to a food…well, here’s why. One it’s a whole grain. Two, it’s a complete protein. Three, it’s gluten free so can accomodate many diets and four, it’s quick and easy to make. Who doesn’t love that. A half cup serving contains ~110 calories, 2.5 grams fiber and 4 grams of protein. I frequently cook quinoa and add any combination of herbs and vegetables to it which is how the stuffed portabella mushroom recipe was created. I’ll put how I made it below but feel free to vary it. The recipe is a great way to make two meals from one dish. I made the quinoa as a side to our dinner Monday and then two days later used it up by stuffing these mushrooms. The second recipe I have been eyeing up ever since I saw the picture of it on pinterest. The fact that it has quinoa, lemon, avocado and cilantro made me know it would taste just as amazing as I had imagined. I will definitely make this one again and I also plan to keep mushrooms around for stuffing when I’m back at work! Bake for 18-20 minutes or until mushrooms are tender. I followed a recipe from pinterest: Quinoa and Avocado Salad with Lemon Tahini Dressing with a few changes. I listed how I cooked it below. This can be made in advance with the avocado added right before serving. If served as a side like we did it would serve 5-6. Chop and add the avocado to the quinoa prior to serving and top with a dash of salt and pepper. It’s officially summer which means it’s time for me to make a ton of grain salads, slaws and other cold dishes. When my mom was in town we went to my favorite food blog: Smitten Kitchen and she found a delicious salad for Memorial Day. I would definitely make this one again! We paired it with burgers and a fruit salad. Toss mangoes, cabbage, pepper and onion in a large bowl. Whisk lime juice, vinegar, oil, salt and red pepper in a smaller bowl and pour over slaw. 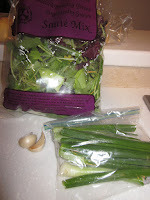 (You can refrigerate it for an hour to let the flavors infuse but you don’t need to). Before serving, toss with mint leaves and sesame seeds. As I sit and look out the window at the snow falling I find myself aching for my garden vegetables. As a dietitian selecting a favorite vegetable is near impossible and ever changing but one of my top picks for the past two years has been kale. I first was introduced to kale chips by my friend, the cohost of Twin Cities Live, Elizabeth Ries. My husband and I have been hooked ever since the first time I made them and it’s one of the only foods he consistently request I make all summer. I realized in the conversion of my blog to this website my kale chip recipe did not make it over. Since I’m running out to Target today and plan to get some kale to make kale chips for dinner I had to repost this as it’s one of our favorite recipes. We have grown kale in our garden for the past two years and it was like the giving tree. It grew and grew and grew and still was fresh to eat through earlier November. I started passing it out to friends, dropping it off in my neighbors mailbox and serving it for every occasion I could think of and it has been a hit! If you have a garden, save a little room and you will be pleasantly surprised. Kale definitely a good thing to fall in love with since it is only 34 calories per cup but packed with nutrition including beta carotene, Vitamin C, Vitamin K and lots of minerals including iron and calcium. It is truly a guilt free treat! 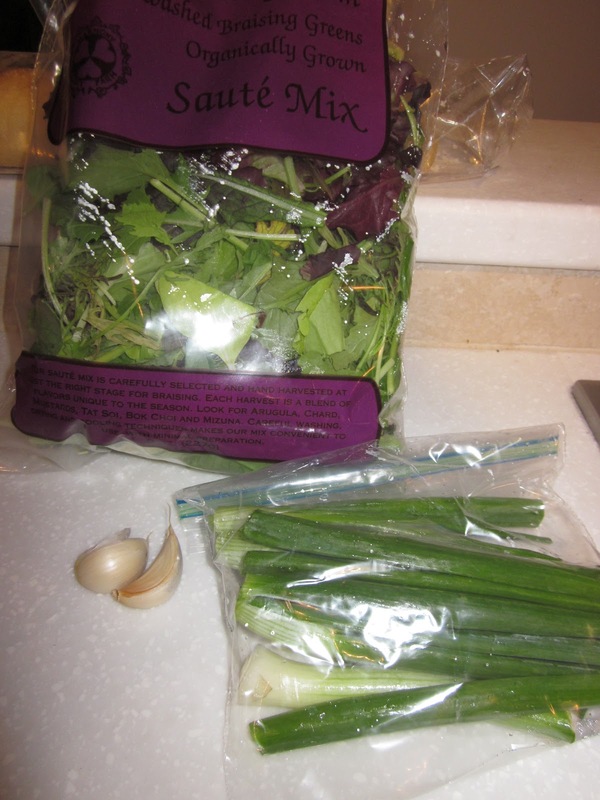 So, I dare those of you who are scared to try leafy greens to make this recipe. You won’t be disappointed. Then, once you become addicted to trying new ways to eat kale like I am I recommend trying the Spicy Tuscan Soup recipe on my site. I also hope to post a delicious kale salad recipe my family made for Thanksgiving and Christmas sometime soon. What was your favorite Thanksgiving dish this year? I was in charge of a vegetable side for our Thanksgiving meal and I chose to make a Brussel Sprouts recipe that I had tried a few weeks back and was a huge success! I made them ahead of time according to the recipe directions with the addition of parmesan cheese sprinkled on top then we reheated them in the oven before we ate. If you like Brussel sprouts you’ll love this recipe that combines the flavors of garlic, bacon and shallots with this crunchy vegetable. Heat a large nonstick skillet over medium-high heat. Add bacon, and sauté for 5 minutes or until bacon begins to brown. Remove pan from heat. Remove the bacon from pan with a slotted spoon, reserving 1 tablespoon drippings in pan (discard the remaining drippings). Return pan to medium-high heat, and stir in bacon, shallot, and Brussels sprouts; sauté 4 minutes. Add garlic, and saute for 4 minutes or until garlic begins to brown, stirring frequently. Add the chicken broth, and bring to a boil. Cook for 2 minutes or until the broth mostly evaporates and the sprouts are crisp-tender, stirring occasionally. Remove from heat; stir in salt and pepper. Now, the best part about post-Thanksgiving. Sharing recipes from your meals. I’d love to hear what your favorite dish was or new things you tried. I love trying new recipes in the winter! The perfect post-Thanksgiving dinner picture: Tenley taking a nap after enjoying her large marrow bone while the family ate their meal. I picked my first tomato from my garden last week and was so overtly excited that it’s officially tomato season. While farmers markets and other gardens have had tomatoes fresh for most of July mine are just coming into bloom. Since starting the food of the month I have anticipated using tomatoes and now the time has come! I am so obsessed with tomatoes I don’t even know how to start and can’t even imagine typing all the recipes I have using fresh tomatoes. For one most of the dishes don’t have recipes. Fresh salsa, marinara sauce and tomato soup are things I just whip up and taste as I go. I’m so excited that I have 12 tomato plants this year. I know I’ll have no issue using them and I may even get fancy and try canning some of my salsa and sauce or make homemade tomato juice! First thing first I want to try to answer a common question that arises. Are tomatoes a fruit or a vegetable? This is an ongoing debate and depends on who you ask. Botanists would say they are a fruit because botanically they grow like fruits but the United States Department of Agriculture, horticulturists and most dietitians classify it as a vegetable. I’m not sure how accurate this is but I read this statement online today (also showing the debate has been going on for centuries): “On May 10, 1893, the United States Supreme Court ruled that the tomato is a vegetable and, as such, is subject to import taxes under the United States Tariff Act of 1883. One medium sized tomato (3” diameter) has ~ 30-35 calories and is a rich source of Vitamin A and Vitamin C. Tomatoes also contain an antioxidant called lycopene which has been studied for it’s cancer fighting properties. Lycopene protects our cells from oxygen damage which can help white blood cells and may also help prevent heart disease. Now how to use them. Well if you’re like me then you’ll pick ’em, slice ’em and top them with a dash of salt and pepper or olive oil and balsamic vinegar (I can eat a few tomatoes at a time when they’re in season). I made these sandwiches for my mom and I when she was in town. While I’ve made MANY caprese panini’s with basil, tomatoes and fresh mozzarella this one was by far the best. The determining factor was balsamic reduction. Mix tomatoes, olive oil, vinegar and basil and layer on top of bread slices. Sprinkle each with salt and pepper. Grate Parmesan on top and serve immediately. You can always prepare the topping ahead of time and assemble them on bread later if you are bringing it to a party. I received a new cookbook for my birthday from my neighbor Greta. The book is from the editors of Whole Living Magazine foreword by Martha Stewart called Power Foods. She knows me well since I love cooking with nutrient dense foods which are the base of their recipes. To give it a test run I made three recipes from the cookbook to bring over for a lunch date with Greta, her mom and baby Matilda. I have to give Greta credit for making this first dish. She’s the first person I’ve ever met who eats parsley raw. That being said I figured she would love this salad which uses parsley as the base. A big thank you to Greta for loving Parsley because I have now discovered a great recipe. The flavor was unique, fresh, flavorful and fulfilling. A mix of a sharp parsley with sweet tones from the citrus and intensified flavor from the salty olives and capers. I thought the flavors would be good but too strong for me but I was proven wrong and now appreciate this herb much more. Next up were the open faced tofu tomato sandwiches inspired by the cookbook cover. If you’re like me you stare at a cookbook and dream about the flavor of the food on the cover and finally get to the point where you have to find out what it tastes like. I was pleasantly happy with the results of this dish but would like to see a little more flavor added to the tofu spread. Maybe a fresh herb, more lemon or garlic? Still worth trying and experimenting with for a vegetarian protein spread. My last dish choice was for my love of green beans, corn on the cob and tomatoes. I think it will be better once I have heirloom tomatoes from the garden but it was very delicious and easy to make. My overall favorite dish was probably the parsley salad followed by the tomato sandwiches. I chose to use basil on the top which was great with the tomatoes. Now for the verdict of the cook book so far: two thumbs up. It’s creative and uses familiar foods in new ways and makes adding unique foods to your diet easy. For anyone who likes to cook new recipes with very healthy foods I recommend trying this book. I’m sure it’s available at most bookstores and I saw it online at amazon. Yesterday was my husbands birthday so the dinner menu was centered around him, which means one thing, BEEF. While reading my Cooking Light magazine this past month I came across a page showing beef brisket sandwiches that looked amazing. After returning to the page to find the recipe I saw that it was an add from Beef It’s What’s For Dinner. Wandering to their website for the first time I found a basic recipe that was perfect to work off of to make the sandwiches (recipe below). I chose to make them in a crock pot instead of the oven since we were out golfing while they cooked. To go with the beef I made corn with a new butter spread. Roasting the jalapeno reduced the spicy kick and the honey and lime zest gave it a great sweet balance (sounds weird but tasted great). Lastly, we balanced our plate with a salad made with lettuce and spring mix from my crop share, red peppers, tomatoes, feta cheese and an avocado. Topped with my coworkers favorite vinaigrette (if she’s okay with me sharing it I’ll post it tomorrow). Even though corn is a starchy vegetable I think we did a good job trying to live up to the MyPlate food guide! It was delicious and enjoyed by all but it didn’t stop there, per Ryan’s request we had chocolate chip cookie dough ice cream cake from DQ! I rarely feel like a meal was the perfect amount of food and all worth remaking but this one nailed it. Not too much food a great combination. Turn crock pot to high and place the chopped onions on the bottom and the beef on top of them. Mix the bottle of beer and chili sauce and pour over the beef. Cover and let cook for 4-5 hours. Remove beef from crock pot and slice thinly against the grain. Place back in the crock pot on low until you are ready to eat. Serve with good buns and the sauce on top. It’s officially April which means fresh vegetables and fruit will begin to ramp up and carry on through fall. I figured what better time than now to feature one of my all time favorite vegetables, asparagus, since it is in season this time of year. Asparagus is a rich source of folate, potassium, Vitamins A, E and C. Not only is it loaded in nutrients it is also low in calories with six spears providing ~22 calories. Asparagus is a great vegetable by itself and a great color and flavor additive for risottos, pastas and salads. 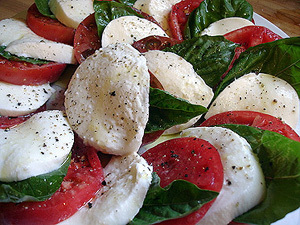 It’s easy to prepare and delicious tossed in olive oil, salt and pepper and placed on the grill or roasted in the oven. The key is not to over cook it. The spears should still have a crunch when you eat them. Here is one of my favorite recipes. Perfect for serving at parties or as a starter for a date night. There are many ways to make this recipe and most traditional recipes don’t cook the prosciutto. I’ve realized over time that I actually prefer it when the prosciutto is slightly cooked and crispy. A trick I’ve learned from preparing this so often is to blanch the asparagus. Cooking the spears for a short amount of time will help them keep their bright green color. 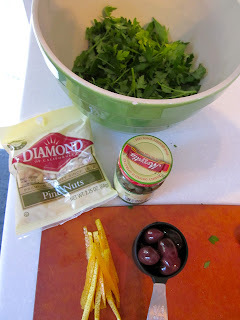 Here is how I make this delicious antipasto. Yes, it’s true asparagus can make your urine smell after eating it but not everyone has the gene. If you have to think about if you’ve noticed this before you definitely don’t have it. Being a carrier of this gene I can say there is no doubt you wouldn’t notice the smell. Turns out asparagus contains a sulfur called murcaptan that makes the smell when it’s broken down in our digestive systems. Cold winter weekends always make me want to cook. This weekend my cooking escapades started with a fabulous brunch with my dear friend Brent. We started by making homemade hash browns; a first for both of us. We then made a poached egg dish with prosciutto, manchego cheese and crushed red peppers layered on a piece of toast: replicated from an entree at my favorite breakfast restaurant in Madison, Marigold Kitchen(If you are ever visiting you have to stop!). My next kitchen endeavor was to prepare Sunday night dinner. After a very relaxing and productive weekend I thought my husband and I could use a good home cooked meal. Knowing the pork chop recipe I was going to make (Cuban Pork Chops with Mojo Source: Guy’s Big Bite- Food Network) I grabbed our Brussels sprouts and squash out of the refrigerator and put my thinking cap on. What should I do with my vegetables tonight? My inspiration for the Brussels sprouts came from the leftover prosciutto and manchego cheese from brunch. For those of you who think Brussels sprouts are bland think again. Next, I had the task of seasoning the squash. Roasting is my favorite way to prepare squash (really most vegetable for that matter). Cinnamon and curry are my go to flavors for this starch and since I was in a creative mood I figured why not try mixing the two. Here’s what I came up with. After watching a lot of football this weekend my mind was drawn to the colors on my plate and the upcoming green vs orange showdown (for those of you non-football followers my Green Bay Packers play the Chicago Bears this weekend for a spot in the Superbowl). I hope the game is as good as this meal was. I was in complete bliss the rest of the evening and reminded that a good meal in with family is priceless. My family is filled with people who love to cook and when we go home we’re always treated to great food. My Aunt Nancy knows how to cook everything, from traditional Italian food (my dad’s family is 100% Italian) to wholesome vegetable dishes from her garden. Then we have my mom and I who both love great food and new recipes. We’re also graced with my brother’s fiancee, Sara, a culinary school grad and professional pastry cook. After much deliberation, we decided to split cooking honors on Christmas Eve and Christmas Day. Today, Christmas Eve, Sara undertook the pivotal task of making a traditional four course Italian meal. Assisting is my dad, an eager culinary pupil, and my brother who has turned into our resident sous chef. Below they are seen creating the Butternut and acorn squash ravioli. My dad’s favorite meals consist of many courses, conversation, and wine. My two cousins, Maddi and Emily, are vegetarians so we have both meat and veggie dishes tonight. Plate of Italian Meats, Cheeses and Olives from Tenuta’s (a great Italian market in Kenosha, WI; definitely worth a trip). MMmmm…I can’t wait to eat. May your holiday be filled with family and finger-lickin’, lip-smackin’, melt in your mouth food just like mine. Buon Natale from the Postorino/Teskey/Reeves family.